To set the Time Timer®, move the red disk counter clockwise to the desired time interval. The disk diminishes silently as time elapses until no red is visible on the timer face. Use as a visual depiction only, or add sound to signal the end of a time segment. A great visual tool for keeping classroom activities like reading, cleanup and homework on time and on task. All timers are free-standing. The 8" and 12" models can also be wall-mounted. 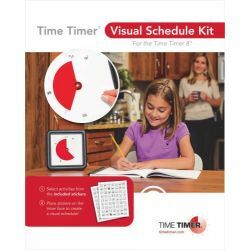 Visual Schedule Kit. 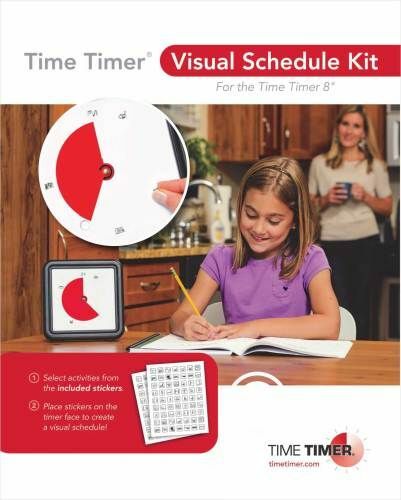 Includes 2 blank faces for the 8" Time Timer (sold separately) and 2 sheets of stickers depicting various activities.